So given your knowledge of acute mental health services is there any precedent/official advice with regard to my question above? Anyone can ask the police to do a welfare check on someone - that is not part of the mental health act and cannot in itself result in some one being admitted or placed under the act. The ability of the police to uplift someone from their home under the act is tightly constrained. It has to be done with the involvement of mental health professionals who must examine the person first. There has to be good cause to believe that a person has a mental disorder before the mental health act is activated and the police can then be asked to assist, if necessary, in transporting the person to a place for assessment. Noting that elements of your version correspond closely with testimony from all sources to date – in your position as a mental health expert – with regard to Fisher’s depiction of “The urgency of the situation”, would there be any scenario where it might be recommended procedure to initially contact work colleagues when presented with immediate threats to a patient’s wellbeing or is contacting mental health services/police directly always the best course of action? If someone has attempted suicide or you’re worried about their immediate safety, do the following. • Call your local mental health crisis assessment team or go with them to the emergency department (ED) at your nearest hospital. • If they are an immediate physical danger to themselves or others, call 111. • Remain with them and help them to stay safe until support arrives. • Try to stay calm and let them know you care. • Keep them talking: listen and ask questions without judging. Hi Mark, I work in the field but wouldn’t call myself an expert necessarily. It depends on the content of the txt the female MP received. If it said I’m going to kill myself now then the best course of action would be to ring the police immediately. But we don’t know the content of the txt. We do know however that Ross came to no harm and was assessed with some alacrity at a mental health unit which is good evidence the actions taken by the MP were appropriate to the level of concern raised by the txt. Informing Ross’ psychologist so they could take action was a sensible thing to do. It would be informative to know the content of the txt and if Slater was present when it was sent. Given that the following day, when he had been admitted, Ross released a private txt to try to damage the reputation of the very woman he had reached out to supposedly for help, one has to wonder what his motive for the txt really was. Thank you Neil, though I’d generally favour leaving an assessment of harm to qualified medical health professionals on hand and/or the patient themselves. The reason I asked is that we’ve heard *a lot* about respecting Jami-Lee Ross’s privacy over the last week so I’m trying to establish whether a patient actually has any right of privacy at all in these types of circumstances or whether the protections are so toothless that a member of the public - on encountering an individual so distressed that further action is required - might be fully entitled to contact whoever they wish in lieu of the emergency services suggested above, which may include informing a political party, regardless of whether there might be a clearly established conflict of interest in terms of them receiving this type of sensitive information. Would it be correct to surmise that no such protections exist? I.e., can a random member of the public, who has been freely given private information by the individual concerned, in the absence of any explicit confidentiality conditions (*), be subject to laws preventing dissemination of private information? Probably not – because the member of the public would then have no statutory duty of stewardship of that information. The presumption is that the individual waived privacy for that information by voluntarily sharing it outside a protected domain. Which is admittedly problematic if that individual’s judgement was impaired at the time. Though I assume the answers would likely be the same – this wasn’t my emphasis. I was thinking more along the lines of the road code – how in the case of a crash which involved injury or even without injury in some cases – reporting the incident to the police is mandatory or face a $5000 fine. Whereas what we see here in the alleged instance of a potential harm is that people are entitled to contact "whoever they wish in lieu of the emergency services" – i.e not contact emergency services at all. I used ‘member of the public’ as opposed to ‘Member of Parliament’ to speculate on how this type of situation might pan out in the private sector, not a random member of the public but a colleague of the patient. is the colleague fully indemnified in ignoring what might be widely considered reasonably held concerns as to the corporation’s “interest” in the patient’s wellbeing and the seriousness of the police investigation and completely within their rights in not bothering to inform authorities but instead notifying a member of their corporation, despite knowing beyond a shadow of a doubt that the corporation is not – to put it euphemistically – working in the patient’s best interests? if serious injury or loss of life had ensued – how liable is a colleague if it were proven that this loss of life etc might have been avoided had they made contact with the authorities directly rather than placing that information in the hands of the corporation to use as nefariously as was adjudged commercially necessary under the circumstances? TLDR: if someone threatens suicide, are members of the public in any way obligated to contact authorities directly (and to ensure authorities are contacted) or is the law just kind of cool if we leave it to a mate to sort out and take their word that that’s what they did? As far as I am aware, there is no requirement for an untrained member of the public to specifically inform emergency services, and only emergency services, about a possible risk of suicide, unless some wider public danger is posed. Somebody receiving a suicide threat probably should contact whomever they believe is most likely to be able to successfully negotiate with that individual. Depending on the individual, that may very well not be the authorities. More echoes of the past - hacked emails allowed in health experts defamation case. NZH: "He said the pair would be required to take the stand for up to an hour during trial." Newsroom: "The most efficient way of eliciting answers was for Graham and Slater to "attend court for up to one day to be orally examined."" When can we start chanting "Lock 'em up!" 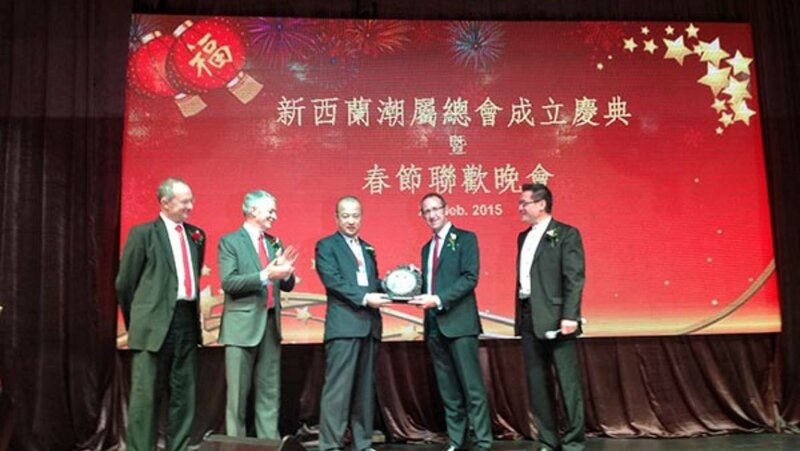 Zhang Yikun with Andrew Little, Phil Twyford, Raymond Huo and Phil Goff. "One of the things we need to do in New Zealand is to start to see China the way it really is. The Chinese Government will see the change of government here as being less friendly to its interests than the previous National government, in particular the Labour-NZ First coalition’s moves on foreign house buyers, which it will see as directly targeting Chinese investors. "The improvement in China’s foreign exchange reserves in July reflects the ramping up of efforts by Chinese authorities to curb capital outflows,” said IHS Markit Asia Pacific economist Rajiv Biswas. The government has been “clamping down on corporate outbound merger and acquisition deals, as well as tougher regulations on private individual remittances for foreign property purchases." The outflows have put significant pressure on the Chinese renminbi, eroding financial confidence and forcing the government to dip into its reserves to shore up the currency. The reserves increased modestly in March, suggesting a small improvement in the situation. Obviously the general population is more likely to pay credence to – checks notes – Stuff.co.nz’s Political Editor than a layperson – which is incidentally why I assume my considerably more generous comment was erm moderated from the Stuff website – moderation of factually based political analysis online likewise being something the CCP might be seen as gravitating towards rather than against. Cameron Slater has been left partially disabled following a stroke. Stuff was providing a platform for Taxpayers' Union propaganda only yesterday. With no qualifications, no context - just a simple copy and paste. Don't expect that to change. They've been discredited so often and so comprehensively and editors still couldn't care less. The copy is free, and no other criteria are needed. And the oik gives up his appeal on the primary defamation case. The court is yet to decide how much money Slater will have to pay Blomfield in damages. Still other cases working through the courts. I think this qualifies as dirty politics. And shame on Newshub for playing along. Their lead story tonight was a poll, commissioned by Business NZ, with obvious skin in the game, asking a very loaded question about CGT. Not just are you for/against, not balanced with other tax changes, but simply ... "Do you think CGT should be a priority for the government?". Well, I know I should go to the dentist and get that fence painted, so on balance I'm probably in favour of those things, but a priority ? No. Doesn't mean I'm against it happening at all, ever. The Reid-Research poll was conducted between March 15-23. An veritable ocean of male troll jism is drowning out the quieter more sensible voices on many issues now and some media outlets are helping it along with free virtual hand jobs. Funny thing is most of the tuggers are virulently hetero, A classic example of boys being boys, an examples we can do without. But this is what sovereign individuals(male) all jacking off, on line, at the same time looks like. They dont need much encouragement either, in fact they seek it out. They made one mediocre clinical psychologist a rich man. Beware the virtual jis. The original report making those unsubstantiated claims (all denied by Crusaders, not just the politicians) has been removed from the Herald website. Hmm. We have a Deputy Prime Minister who explicitly demonised Muslims and has built their career on fostering ethic hatred. That might be the place to start – where people did actually incite hatred for political gain.